When I initially posted this article it was my intention to show how animals help man. Admittedly, I was unaware of the abusive, exploitative industry these elephants are a product of. "Thais have long revered elephants as a national symbol. Now, the task of cleaning up in the aftermath of the deadly tsunami has, at least temporarily, brought elephants out of technological retirement." "Even more ironic are stories of captive elephants in the Tsunami region, carrying tourists to safety or helping in the clean-up. In Thailand, baby elephants to be employed in the tourist industry are dragged from their mothers and have their spirits broken in a practice called Phaajaan. They are held in pens for three days and tortured. Many die. Each elephant's mother is chained nearby so that the baby learns that when he screams, his mother cannot or will not come to help -- he learns that he is utterly at the mercy of humans. 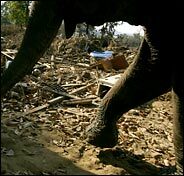 You can see horrifying footage, or a slide show, of Phaajaan at http://www.helpthaielephants.com/. Last year, PETA asked tourists to boycott Thailand to protest the practice. While talk of a boycott no longer seems appropriate, stories of elephants helping humans give us an opportunity to talk about what humans in Thailand do to elephants, and, of course, what we support if we ride elephants while traveling, or go to see Asian elephants at circuses." Always include your full name, address, and daytime phone number when sending a letter to the editor. Shorter letters are more likely to be published. I am always happy to edit letters. It is natural to feel helpless in the face of such a disaster. Those of us who cannot go to the disaster sites to help, can donate; funds help. (Vegetarian food relief: http://www.ffl.org ) And we can write letters to the editor, appealing to the world's heightened state of compassion, and reminding people that there is daily massive suffering that generally doesn't make the news, and which humans have the power to stop. Since those in animal abuse industries like to portray animal advocates as misanthropes, it is important to remember, in such letters, to express the sympathy for the human victims -- sympathy that we might just take for granted. There is a line to be walked, pointing out the ironies in some of the animal stories without appearing to have little concern for people. It is worth walking -- our letters are worthwhile. They don't bring the same immediate gratification as handing out food or providing shelter. But whether read by the public, or by news editors, they make sure that the plight of non humans is part of the public dialogue. They give a voice to those who suffer year round and who rely on a small group of committed people to speak on their behalf. An update since that Wednesday alert: I shared the story of the rescue of one trapped dolphin and the apparent death of another. It has not been in the news, but Jill Robinson, from Animals Asia, who was in Phuket this week, tells me she was told by others on the scene that "there may only have been one dolphin after all in the Tsunami made lake and that pictures showing two individual animals, may actually have been of one and the same dolphin, which had been reversed." A hopeful thought. But then every year thousands of dolphins still suffer and/or die at human hands. the media and facilitates one-click responses to the relevant media outlets. At Bang Niang Beach, a resort area in Phang Nga Province, elephants walked through a badly damaged area. They can go where cars cannot. HAO LAK, Thailand, Jan. 6 - Up to his knees in mud, Plai Sudor gently pushed aside a car to reveal a tsunami victim lost in a lagoon. Lumbering down a jungle path, this saggy, baggy 30-year-old carried, slung from his tusks, a green plastic bag loaded with a 200-pound body. Thais have long revered elephants as a national symbol. Now, the task of cleaning up in the aftermath of the deadly tsunami has, at least temporarily, brought elephants out of technological retirement. The Dec. 26 wave was so strong that the surging water deposited bodies in dense forests one mile in from the Andaman Sea beachfront resorts, which were packed with European tourists. "We need elephant power, because there are things we can't move, places where heavy equipment can't go," said Siriwan Phakphin, leader of a search team that has recovered 80 bodies in the last week. She chatted Thursday during a lunch break. Nearby, Plai Sudor took his own lunch break, snacking on fresh sugar cane stalks brought by his handler, Nimit Insamran. Scattered through the jungle and rubber plantation were three other elephants from the same elephant park, Ayutthaya Elephant Palace. In the 17th century Ayutthaya was Thailand's capital, a place where gray elephants were the most important beasts of burden and rare white elephants were revered as sacred. These animals that once played such a central role in Thailand's culture and economy have been made increasingly obsolete by the country's growing fleet of backhoes and bulldozers. But they have become critical in dealing with the catastrophe here: flattened trees, holes punched in buildings, a police patrol boat perched at the forest edge one mile in from the sea and, above all, the stench of decaying bodies. About 40 miles north of Phuket, the internationally known tourist destination, the beach resort area of Phang Nga Province was the hardest hit in Thailand, recording 4,134 confirmed dead - of a national total of just over 5,000 - and 2,113 missing. About half of the dead and missing are foreigners. "There are many more bodies out there," a South Korean searcher said, surveying a fetid saltwater lagoon that had been created by the wall of water that roared through the area on the morning of Dec. 26. To find bodies, the team dispatched by the South Korean government used dogs. But Ms. Phakphin criticized those animals' performance, saying her workers had found bodies in areas cleared by the dogs. "With the elephant we get two for one," she said. "The elephant can help find bodies. They can also help move bodies through the jungle. Before we got an elephant, we moved a body two kilometers through the jungle," a distance of a mile and a quarter. "My staff could not walk after that" in the tropical heat. In Aceh Province in Indonesia, far poorer and harder hit than southern Thailand, elephants also have been put to work to locate bodies. Elephants from the Elephant Training Center, just outside Banda Aceh, the provincial capital, have worked clearing roads and moving debris. Here in Khao Luk, people are talking about how eight elephants from a local tourist ride may have saved the lives of a dozen European tourists. After the earthquake, the elephants started trumpeting oddly. Then, shortly before the first tsunami hit, the story goes, they bolted for high ground, charging through jungle, with frightened tourists clinging desperately to their baskets on top. Down below, the waves were crashing through the resorts, wiping villas cleanly off their foundations, wrapping pickup trucks around utility poles, wedging a motorboat into a second-floor balcony and sending hundreds of tourists running, too late, for the high ground. Elephant clears debris near Bang Nieng beach in Khao Lak, Thailand, yesterday during cleanup and recovery from tsunami. PHUKET, Thailand - Six elephants joined the search for bodies in Thailand's tsunami-devastated coastal region yesterday, clearing debris-strewn forests for rescue teams to retrieve rotting corpses. The jumbos, which were used to create war scenes in Oliver Stone's recent blockbuster "Alexander," were trucked in from an elephant camp in the ancient capital Ayuthea, 500 miles north of shattered Phuket island, to help speed up the search operation. "We use the elephants because a truck can't pass through the thick forest," said trainer Laitonglian Meephan as he yelled commands at the giant beasts to move through the thick mangrove. "The elephant is like a four-wheel drive. They walk in the forest all their life." With chains and ropes tied around their enormous frames, they pulled concrete slabs and giant tree trunks away to reveal the decayed body of an unidentified man. They also dragged a submerged 10-seater van from a tiny lake littered with fridges, television sets and children's toys. Hundreds of bodies are still believed trapped under piles ofconcrete and rubble a week after the tidal waves wiped out entire beachfronts around the popular holiday destination of Phuket. The six elephants arrived yesterday and began work immediately on the muddy, hilly terrain. "The six were chosen because they are smart and can act on command," said Romthongsai Meephan, one of the elephant farm's owners. Some areas were too remote to transport heavy earthmoving equipment, making the task almost impossible for overwhelmed rescue teams. With nearly 4,000 people still unaccounted for in Thailand, the elephants will continue their recovery work into next week, the trainer said. In Indonesia, an additional 11 elephants - native to badly hit Sumatra island - have been pressed into similar duty because there were few trucks and other heavy equipment to do the job there. A TV report showed them pulling a sport-utility vehicle from a collapsed building.